Annabelle has this fuzzy stuffed ball that she loves. She’ll snuggle her head into it and lay on the ground, using it as a pillow, and just nuzzle it. It’s pretty cute to see, and she does it ALL the time. She’ll even start laughing as she does it. Well, this morning, I’m sitting here and she climbs up to me, wanting held, and of course I agree to this. She then proceeds to try and climb up the front of me, then pretends my head is her ball. She puts her cheek flat against my head and starts smushing my face against her cheek, non-too-gentle, but like flatten Mommy’s nose, then starts go giggle and laugh as she continues to do it. Mommy, of course, was laughing too… tears running down my face. Then she pulls back, looks at me with this big toothy grin, then returns to her cheek-plant on Mommy’s head. Yeah, evidently she thinks my head is a stuffed ball. I know you’re probably like, “and that’s funny how?? ?” but you had to be there, I guess. At clinic… playing with the picture! And this Momma will take every single snuggle, no matter how oddly given!!! Oh, we had our one-month-post-cath cardiology visit on Monday! WOOHOO!!! It went FABULOUS! Annabelle looks GREAT, her heart looks GREAT, her labs look GREAT, her weight looks GREAT (well, improving anyway! ), and yeah, everything was just GREAT. And, we don’t have to go back for TWO MONTHS!!!! That’s the longest Annabelle has ever been without an echo!! We do have to go back first part of June for labs (she’ll be on monthly labs for at least another year or two.) But still this is pretty big progress for us! Matt Hammitt, lead singer of the super popular Christian band, Sanctus Real, wrote a book. Actually, he wrote a song, and turned it into a book! If you’ll recall, I’ve posted before about his little boy, Bowen, who was born a few months after Annabelle with the same type heart defect as Annabelle. 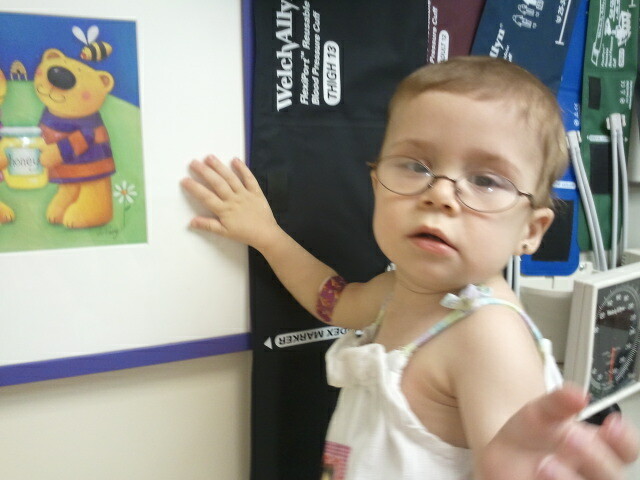 He also crashed not long after his 1st surgery and had to be put on ECMO emergently, just like Annabelle. He’s doing FABULOUS now, and his parents have started Whole Hearts Foundation to help other heart families and to raise funds for research/Children’s hospitals. 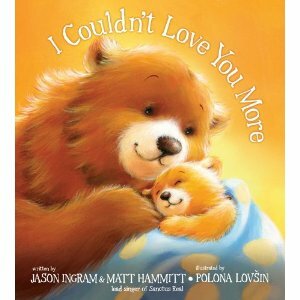 Anywho, his new book, I Couldn’t Love You More, is a children’s book, and uses the lyrics from a song that he wrote and recorded for baby Bowen (guess I need to call him big boy Bowen now though!!) A portion of the profits from the sale of the book go toward Whole Hearts Foundation, which I find SUPER cool!! He will also be here in the Nashville area on Tuesday, May 8th at the Franklin, TN Lifeway (from 11 to 1 I believe) so you can meet Matt and get your autographed copy too! Matt and his wife, Sarah, are just amazing people. They supported us a bunch while we were in the hospital, Matt even came and visited Annabelle three times, and brought the whole band along one time. So I’m excited to spread the word about this new venture, and if our schedule works out, Annabelle and I plan to go buy her copy of the book on Tuesday too! As I was getting ready to post this… I checked facebook. And my heart completely utterly broke. Mr. Isaac Matthew went to be with Jesus just a few hours ago. This sweet little baby boy had some amazing, faith-filled parents, and he fought one of the hardest fights I’ve seen, and I’ve witnessed a lot of them. I’ve followed his story for a long time… he crashed last summer right around the time Annabelle did in July. His doctor’s gave up on him, but his parents did NOT. He was transferred to Boston Children’s, where they did some pretty risky surgeries and he was able to get to the point of going “home” for a little while. I just… I can’t put into words right now. I’ve seen/followed way too many babies who went to be with Jesus very early, and while I am happy they are no longer suffering… it’s just plain hard. I’d kinda gotten numb to it for a bit, you have to in order to keep going… but… yeah. This is like a sucker punch in my gut today. A reminder of the reality us heart parents live with Ever. Single. Day. Life is a gift… it is precious… and wow. Hugging my Annabelle extra tight today. Please pray for Isaac’s mom and dad and brother and sister. After some very close friends lost their young daughter to cancer, I was touched at how someone else comforted them. She said, (paraphrasing) "You know how on Christmas Eve you get all of your kids' presents ready and when everything is all set up you just can't wait until morning and you want to go wake them up so they can enjoy it all right then? I think that's how God feels sometimes. He has this special gift prepared for us, and sometimes it's just so perfect He can't wait to show it to us." I was smiling until I got to the end of your post. My heart hurts so much for them right now. 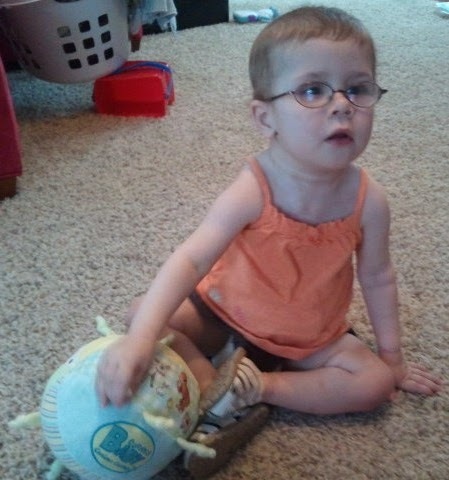 As for Annabelle using your head as her ball…my kids have done that too and it's adorable. How sweet, glad Annabelle is doing so well. As for the ending, well, I'm a bit numb to all death but I feel terrible for their loss.